TomorrowWorld recently announced the final lineup for its third annual festival that will commence on 25 September 2015. Following its headliner announcements that included Hardwell, Bassnectar, Kaskade, Porter Robinson, DJ Snake, The Magician, Get Real and more, TomorrowWorld now welcomes an eclectic array of dance music artists to join them on the grounds of Chattahoochee Hills, Georgia, in just a few months. Holding possibly one of the deepest and most impressive lineups of this year's festival season, TomorrowWorld features 100+ dance artists that will take over seven stages across three days. With everyone from Martin Garrix to Tchami, Andy C to Justin Martin, ex-NBA star Shaq aka DJ Diesel, Snails, and more on the bill, the event aims to cover the entire electronic music spectrum, while keeping a focus on burgeoning artists that will help shape the sound of tomorrow. 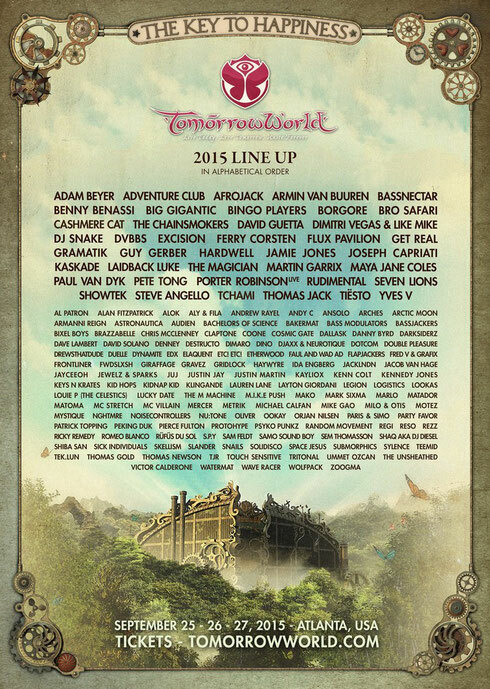 Now that the full TomorrowWorld 2015 lineup is released, look out for who is curating the stages for Revealed Recordings, Future Classics, All Gone Pete Tong, The Magician's Potion and more.